Visitors to the Grand Turk Cruise Center (GTCC) are greeted by a whale of a sculpture – a pair of humpback whales that is, which are perched at the shoreline of the facility’s 800-foot-long private beach. Created by California-based Storyland Studios, the massive 12-foot-high by 38-foot-long sculpture depicts two whales “breaching” through the powdery white sand, providing a playful backdrop as guests relax on the beach or frolic in the soothing aquamarine waters. 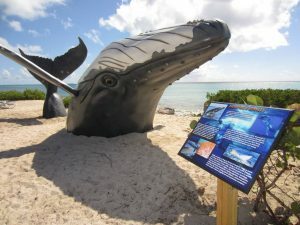 Adjacent to the sculpture is signage that offers a variety of interesting whale facts, along with photos of these majestic and mysterious creatures. The sculpture is the latest addition to the facility which recently debuted a series of murals celebrating the historic 1962 splashdown of the Mercury Friendship 7 capsule off the island’s coast, part of the GTCC’s free Splashdown Grand Turk attraction. Opened by Carnival Corporation & plc in 2006, the Grand Turk Cruise Center serves as a gateway to this unique destination and encompasses a state-of-the-art pier and an 18-acre complex offering a variety of shops and restaurants. The 2012 cruise season will include 285 ship calls bringing 675,000 visitors to the island.